Home / What is Trisomy 18? / How is Trisomy 18 Diagnosed? Most cases of Trisomy 18 are diagnosed prenatally in the United States. Regardless of whether the diagnosis is made prenatally or postnatally (after birth) the process is the same. A sample of the baby’s dna is extracted from a blood sample or other bodily cells or tissue and is cultured to examine a picture of the chromosomes called a karyotype. 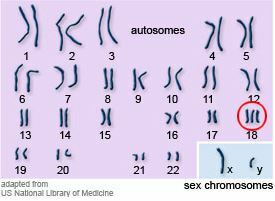 A karyotype is simply a picture of a person’s chromosomes. In order to get this picture, the chromosomes are isolated, stained, and examined under the microscope. Most often, this is done using the chromosomes in the white blood cells. A picture of the chromosomes is taken through the microscope. A visible extra 18th chromosome confirms a Trisomy 18 diagnosis.